This year, digital marketers are focusing on revenue growth, customer satisfaction, return on investment, customer retention, and customer acquisition as metrics for success. According to the 2015 State of Marketing report, 66 per cent of marketers believe social media marketing is core to their business and have a dedicated team to manage their social media campaigns. For small businesses, a lack of resources often stands in the way of achieving social media success. Fortunately, there is a way for small businesses to manage social, even when they lack time, personnel, and budget. In this post, we look at strategies to create an effective social media strategy with minimal resources. The first step with any marketing strategy is to set realistic goals for what you want to get out of your efforts. Your goals for social media may match the previously mentioned digital marketing success metrics of revenue growth, customer satisfaction, return on investment, customer retention, and customer acquisition. Or, your main goals may be more exposure and a positive reputation for your business. All of these goals are achievable on social media. The key is to know which ones you want to focus on and then craft your social media strategy accordingly. Why? Because the strategy you would create to achieve customer acquisition would differ from the strategy you would create to achieve customer satisfaction. One requires you to look for new potential customers, while the other requires you help current customers. Also, note that some goals are tied directly to others. If you achieve the goal of customer acquisition, then with proper metrics measurement (which we will discuss later), you will also achieve revenue growth and return on investment goals. If you achieve great customer satisfaction, then customer retention should naturally follow. The goal you choose will depend on the status of your business. Startups would likely want to focus on getting exposure for their new business and then work on customer acquisition down the road. Businesses in a slump would likely want to focus on customer acquisition. 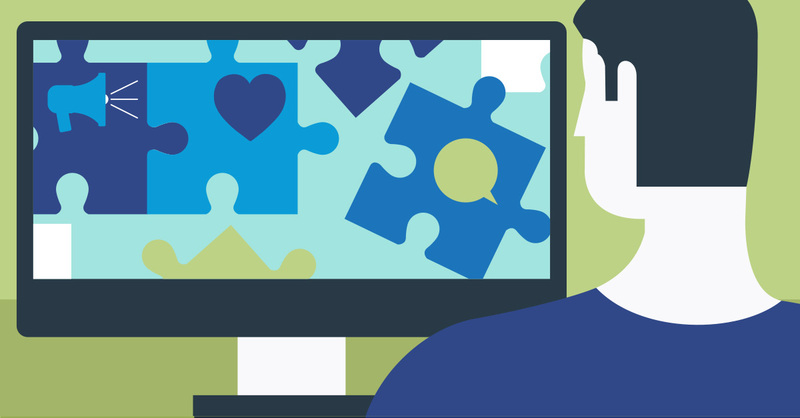 Businesses with a strong customer base would likely want to focus on customer satisfaction. 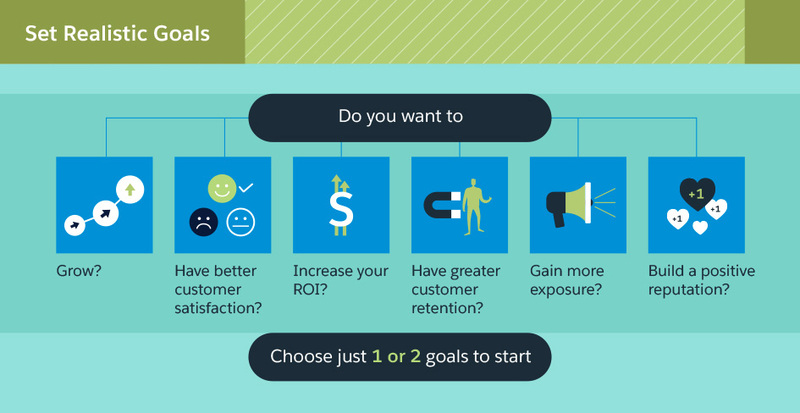 Choose one or two goals for your social media strategy to start. Once you have those goals in mind, move on to the next step. 2. Choose the right networks to achieve your goals. When it comes to social networks, there are plenty to choose from. If you read the top social media blogs, you'll see articles on how Facebook, Twitter, LinkedIn, Google+, Pinterest, Instagram, Tumblr, YouTube, Vine, Snapchat, Meerkat, and Periscope can benefit your business. But for small businesses that are short on time and personnel, creating an effective plan for all of these networks is simply not possible or wise. Prioritize quality over quantity. Instead of spreading yourself thin on multiple networks, focus on one or two networks at a time. It's better to immerse yourself in everything Facebook has to offer than to barely have enough time to post a relevant, quality update to ten networks every day. Continuous engagement, not a one-off status update, helps a business become successful on a social network. Use your personal profile to create groups to engage with your customers. Post updates to your page and respond to customer service inquiries. Create advertising campaigns geared toward your target customer base. Post status updates, monitor keywords related to your business to engage with new potential customers, respond to customer service inquiries, and participate in or lead Twitter chats. Post updates using your personal profile and company page. Use your personal profile to participate in groups in which your target customers are active. Once you have fully immersed yourself in one network, doing the same for an additional network will be simpler. You will have a good workflow in place with the first network so you don’t have to learn the ins and outs of two at the same time. 3. Focus on the activity that will help you achieve your goals. There are many things you can do on various social media networks, both business related and non-business related. Whenever you log into the social network you choose to focus on, remember your goals and don't get sucked into other aspects of the platform that may not help you achieve those goals. A social network game won’t help any business unless your business sells game cheats, and you are meeting people who need them. But there are other social activities that can also hinder your goals. For example, if you concentrate your efforts on LinkedIn and participate in group discussions, you may find that being helpful in one group leads to private messages about your business from the person you helped. But being helpful in another group results in zero messages. This is the kind of thing you need to be aware of while immersing yourself into various social networks. You gauge your overall success off one day's worth of activity. But after a month, if you notice one group generates leads and another doesn't, invest the time you spent in the latter group on the former group. 4. Spend advertising budgets on targeted advertising. Advertising is becoming a necessary part of social media marketing. Facebook has continued to lower the organic reach of business page posts, and Twitter has hinted at a Facebook-like filtering algorithm. Even Pinterest is working on a smart feed. All of these mean you can't guarantee your organic posts will reach everyone you intend for them to reach. For this reason, it’s a good idea to share sponsored posts on a number of networks. The key to getting the most out of your social media advertising, even with the smallest budgets, is to target. Spend time defining your target audience or your ideal customers. Then you can target social media ads toward the people most likely to convert from social media fans to customers. 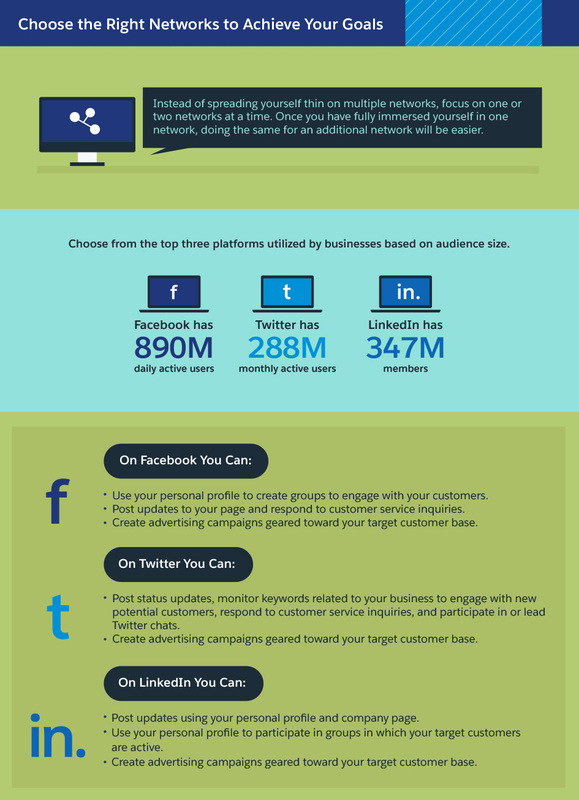 Businesses of all sizes can use Facebook, Twitter, and LinkedIn ads to reach their target audiences. 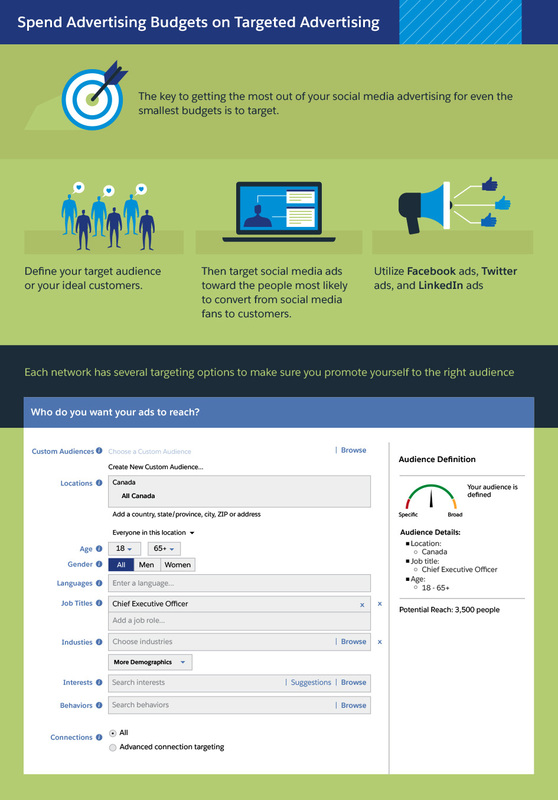 Each network has several targeting options to make sure you promote yourself to the right audience. Each network also allows you to set daily budgets, lifetime budgets, and time durations for your campaigns so you can stay in control of your ad spending. Your best option for a small advertising budget is to start with a highly targeted audience for your ad campaigns. Then slowly expand that audience as necessary. With both organic and paid social media campaigns, analytics are a crucial element that help you achieve your social media goals. 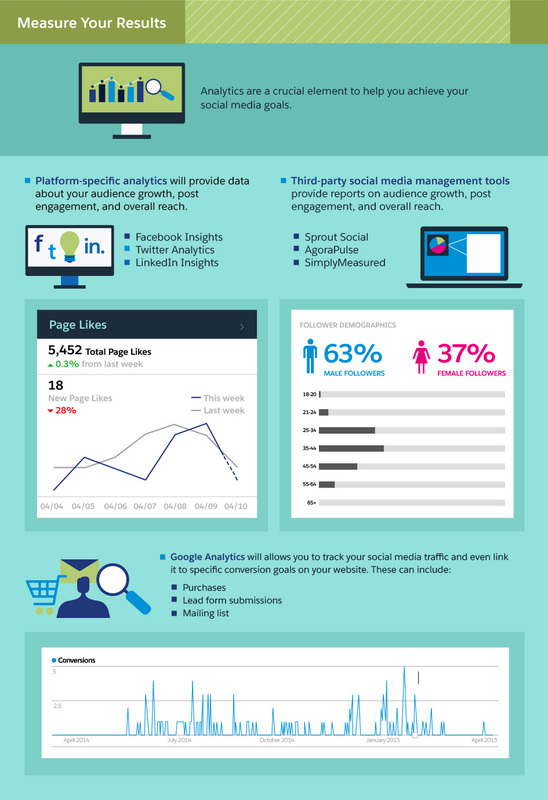 There are several tools you can turn to for social analytics. First, you have the analytics tools provided by each social network. Facebook Insights, Twitter Analytics, and LinkedIn Insights will provide you data about your audience growth, post engagement, and overall reach. You also have third-party social media management tools that provide reports on those same metrics. There are hundreds of social media management tools to choose from: Two that provide great reporting at a small business-friendly budget include Sprout Social and AgoraPulse. You can also run some free social media reports on a one-time basis using Simply Measured. Most importantly, you have Google Analytics, which allows you to track your social media traffic and even link it to specific conversion goals on your website. These can include purchases, lead form submissions, mailing list subscriptions, and more. With all these tools, you can find out whether or not your social media activity gains engagement from your target audience, drives traffic to your website, and leads to meaningful conversions for your business. Once you determine your social media goals, immerse yourself in the top networks for your industry, learn how to engage with your target audience organically and through advertising, and measure your results, you will be well on your way to a successful social media strategy. With continuous measurement of your results using your preferred analytics tools, you can ensure your efforts help you achieve your goals.